Helfrich's Firefish Goby - Nemateleotris helfrichi Helfrich's Firefish is a member of the family Microdesmidae, which are often referred to as firefishes or dartfishes. This rare species has a bright pink light front half, a lighter pink rear half, a yellow area on its head and pink and yellow on the fins. It is recommended only for the highly experienced aquarist with a well-established reef, because it is more delicate than the other species of firefishes. Do not attempt the Helfrich's Firefish if your aquarium runs warm or if you have any remotely boisterous fishes. This fish cannot tolerate either. It will ignore its tankmates, with the possible exception of other firefish species. Helfrich's Firefish has a very mild personality, and it will be picked on by more pugnacious fishes. Helfrich's Firefish can jump from open tanks. The Helfrich�s Firefish are often more expensive than its other species because other fishes are abundant in Indonesia and the Philippines where they are plentiful and labor is cheap. Helfrich's Firefish is not found in these areas, and is not plentiful in areas where it is collected. It has a limited range in nature, and is found only in deep water. 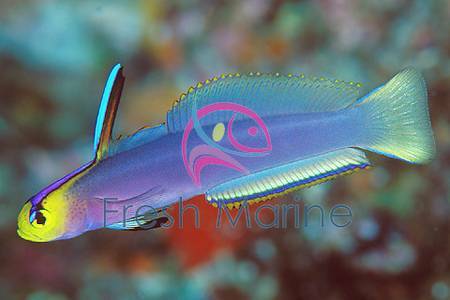 The Helfrich Firefish goby is timid and will require peaceful tank mates. It likes plenty of places to hide and is suitable for most reef settings. This fish will fight with it's own genus and tends to jump when stressed. The Helfrich's Firefish cannot tolerate warm temperatures. In aquarium, the Helfrich's Firefish are peaceful fish that usually inhabit the middle level of the tank unlike other gobies. They have a specialized swim bladders that allows them to float in one place without a lot of effort. The Helfrich's Firefish as a group tend to be very shy and should be supplied with many dark cave that they can duck into when they feel threatened. Maximum Size: The Helfrich's Firefish grows up to 3 inches. These fish generally will come to you 2 - 4 inches. Minimum Tank Size Suggested: The Helfrich's Firefish prefers a tank of at least 20 gallons with plenty of places to hide and swim. Habitat: The Helfrich's Firefish is the deepest-dwelling species of the genus, rarely found in less than 40 m. They are imported to America predominantly from the Marshall Islands/Micronesia, and have a small adult size of 2-3" (6 cm). This exquisite little fish is hardy once established, and fairly tolerant of conspecifics, but demands the most peaceful tankmates. They are easily intimidated into starvation and are best reserved, perhaps, for a biotope or species-specific display. Photo by Anthony Calfornia. The Helfrich's Firefish can usually be found over hard, open bottoms and rubble patches at the base of the reef. In the wild he Helfrich's Firefish feeds on zooplankton. It has a tendancy to twitch its long dorsal fin back and forth. Feeding and Diet: The Helfrich's Firefish are shy feeders that will usually accept flake food, brine shrimp, and just about anything else that drifts by their little hideout. However they will not feed from the bottom of the tank. In the wild they feed on plankton, fish larvae, and small crustaceans.